First, businesses discovered quality as a key competitive edge; next came science. Now, Donald A. Norman, former Director of the Institute for Cognitive Science at the University of California, reveals how smart design is the new frontier. 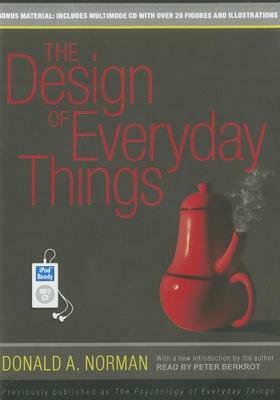 The Design of Everyday Things is a powerful primer on how-and why-some products satisfy customers while others only frustrate them. Donald A. Norman is the Breed Professor of Design at Northwestern University and the author of "Emotional Design" and "The Design of Future Things." A veteran of stage and screen, Peter Berkrot held feature roles in "Caddyshack" and Showtime's "Brotherhood." He has recorded over 170 audiobooks, over 100 for children; has been nominated for an Audie Award; and has received a number of "AudioFile" Earphones Awards and starred reviews.